How can we teach our athletes and ourselves to fail better?Learning to fail better can greatly improve one’s growth and development. Editor’s Note from Brian: I believe that these 7 lessons apply in athletics when athletes or coaches are working to acquire new skills or improve existing ones as well as in academics. 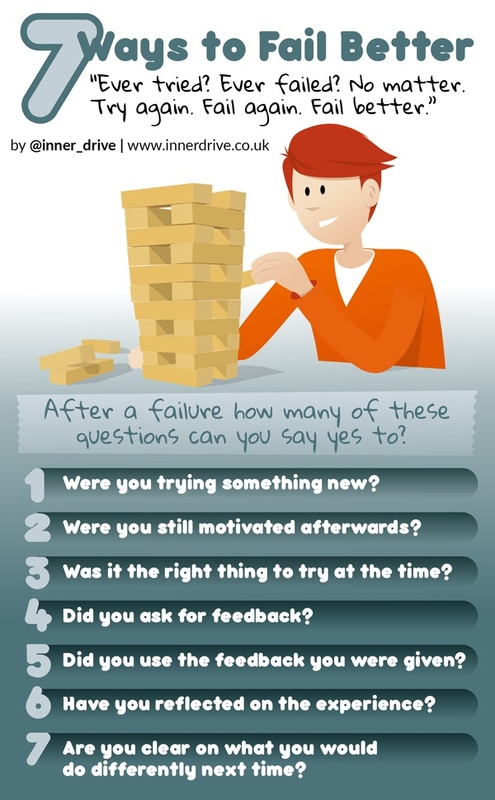 How well do your students fail? Poet Samuel Beckett once said, “Ever tried. Ever failed. No matter. Try Again. Fail again. Fail better.” Turns out he was sort of right, as research by psychologists over the past two decades has found that the way you explain your failures can have a profound impact on your future behaviour. Research from sport suggests that if athletes attribute failure to permanent causes instead of temporary ones, and if they overgeneralise instead of being specific, it can lead to them feeling less confident, more anxious and performing worse in the future. Could this be applied in schools? Students have many highs and lows over the course of the year. Failure at some stage is inevitable. Some students see their failures as permanent (“I will never be good at art” vs. “I am struggling in art at the moment”), and they overgeneralise (“I don’t like maths” vs. “I don’t like algebra”). To combat this, some schools have started running a ‘failure week’ to help promote the importance of taking risks, learning from mistakes, and reducing students’ fear of failure. Others are incorporating these principles regularly into PHSE lessons and enrichment days. Were they trying something new? Being open and enthusiastic about new and challenging situations is a key characteristic of having a growth mindset. We want to help students shift away from focusing on ‘proving myself’ and more towards ‘improving myself’. The teenage years offer a unique window of self-discovery and improving self-awareness. It can be when people discover what they are passionate about. Part of this process is trying new things, experimenting, and finding out what one’s strengths/weaknesses might be. Failures are integral to this. Helping students understand this can help aid their learning and development. Were they still motivated after the setback? Research on teenagers has found that those who are motivated by learning and mastering a subject, compared to those who are extrinsically motivated by rewards, display higher levels of emotional control before an exam, have higher levels of confidence, and achieve better academic performance. Doing well at school is more akin to a marathon, rather than a sprint. Motivation needs to be robust and durable in order to aid resilience. Focusing on improvement, on learning, and on getting better should ensure that this happens. Was it the right thing to try at the time? It is easy for students to judge how good their decisions are based on the outcome (i.e. if it ended up well, it was a good decision; if it ended up badly, it was a bad one). This is a mistake, as sometimes the result may be down to randomness, luck, or a million other factors. This can lead to people throwing the baby out with the bath water. Statistician Nate Silver, the only man in America who correctly predicted how each of the 50 states would vote in the 2012 Presidential election, states that instead of judging decisions based on the eventual outcome, it is far better to judge them based on the information you had at the time. If students make the best decision possible from the information available, then perhaps the mistake was down to execution of the skill and not the thought process going into it. This is an important distinction to make, as it can help identify which part of the process to target for improvement next time. Did they ask for feedback (and then use it)? There is a great quote that says, “Real failure is a man who has blundered, but not cashed in on the experience.” If students are going to suffer from setbacks (and it is a certainty that they will at some stage), then there is a three-part way to ensure they learn the most from it. First is the act of asking for feedback. This is a great behaviour to praise, as it is the behaviour you want them repeat after future failures. Second is being open to the feedback. This is a fundamental part of learning. If students feel that they are being judged or attacked, it is unlikely that they will heed the feedback, no matter how helpful. Third is getting them to action the feedback. It is not enough to have good intentions; behaviour change comes from doing, not just thinking about it. Did they reflect on the experience and know what they would do differently? Setbacks can aid the learning process, but only if the person experiencing it takes the time to reflect on what has happened and as a result, is clear on what they would do differently next time. Otherwise, it is likely that they will repeat the same mistakes again and again in the future. It is ok to make mistakes. To keep making the same one is criminal. Having students ask themselves ‘what would I do differently next time?’ is a great question for two reasons. First, it stops them dwelling on the past, which can reduce student stress. Second, it gives them a sense of control over the situation, which will help boost their confidence and motivation when moving forward into the future. We all want the students we work with to be successful; however, it would be foolish to think that they will never fail. We don’t want students to fail more, but if (and when) some of them do fail, we want them to fail better. Helping them fail better isn’t negative; if anything, it may be one of the most positive skills we could teach them. How can you manage time better so you can perform at the highest level in your career, for your team, and for your family.? I know that I am probably preaching to the choir by sending this information to a group of coaches who have committed already to reading a newsletter about productivity for coaches. I ask this because as I continue to train coaches on how to manage their time better so they can perform at the highest level for their career, their team, and for their family, I’m finding more and more how many coaches actually hate this topic . . . at first. Better time management can help you do more of what you have to do – faster. This doesn’t mean cutting corners or a decrease in quality. You just do what you have to do quicker (office paperwork) so you can do what you want to do sooner (coaching your sport or going home to spend more time with your family). When you don’t have control of your time, it’s easy to end up feeling rushed and overwhelmed with all there is to do. And when that happens, coaches tend to work harder and longer which leads to burnout and fatigue. Once you learn how to manage your time, you no longer subject yourself to that level of stress. Besides it being better for your health, you have a clearer picture of the demands on your time. Everyone needs time to relax and unwind. Unfortunately, though, many of us don’t get enough of it. Between office responsibilities, recruiting, family responsibilities, errands, and upkeep on the house and the yard, most of us are hard-pressed to find even 10 minutes to sit and do nothing. Having good time management skills helps you find that time. When you’re more structured, focused, and disciplined to get the right things done, you’re going to get more done in less time. You accumulate extra time throughout your day that you can use later to relax, unwind, and prepare for a good night’s sleep. Your ability to manage time has a direct effect on your energy levels. Strange but true — the act of finishing tasks often brings a level of satisfaction and energy that makes you feel good. The importance of time management here? It will help you do more of those endorphin releasing activities. Time management is the key to success. It allows you to take control of your life and career rather than following the flow of others. As you accomplish more each day, make more sound decisions, and feel more in control, people notice. Your team will notice that you are more organized and have more energy to lead and run your practices. Your administration will notice that you are happier, more organized, and will see it in your team’s results. After all, that’s what it’s about, isn’t it? What’s the importance of time management in your life? The more value you put on your time, the greater your ability to learn how to do what matters so you can enjoy life more. Managing how you use your time is a means to an end, but it brings enjoyment and satisfaction in its own right as well. Time management is ultimately about working a vision backwards into strategic and scheduled chunks of time and tasks. If you are not being strategic about what you want to accomplish in your life or with your program, then I feel you are just kind of doing random tasks each day and you find yourself doing busy work instead of work what is going to move your life, career, or program forward. Time management is not just about improving your efficiency at work. The efficient utilization of time gives you as a coach the opportunity to maximize your potential to do what it is you want to do with your time. The efficient utilization of your time improves efficiency, productivity, and personal satisfaction. Learning to manage your time, will greatly improve your coaching life quality by whatever definition you choose. Commit to making time management a high priority for 2018. Good luck and as always, let me know if there is anything I can do to help! Preventing knee injuries are important for all athletes. In this post see data the indicates which sports and specific activities produce the most knee injuries. Each month, The Center for Injury Research and Policy at The Research Institute at Nationwide Children’s Hospital provides T&C with an inside look at their studies of high school athletic injuries. In this installment, Dawn Comstock, PhD, takes a look at knee injuries, examining gender-specific trends and breaking down each sport’s most common mechanisms of injury. Athletes often devote hours to strengthening their legs and increasing knee flexibility, hoping not only to excel at their sport, but also prevent a season-ending knee injury. And athletes have good reason: knee injuries are one of the most common sports injuries, with U.S. doctors and surgeons treating over half a million high school student-athlete knee injuries every year. They are also among the most costly, and knee injuries account for almost half of all surgeries performed among high school athletes. • Knee injuries are three times more likely to occur during competition than practice. • Football players are at greatest risk for knee injury–on any given day, for every 460 athletes playing in a football game, one will sustain a knee injury. • Among girls, soccer players are at greatest risk for knee injury–on any given day, for every 850 female athletes playing in a soccer game, one will sustain a knee injury. • Girls participating in soccer, basketball, and softball are about 50 percent more likely to sustain knee injuries than boys playing these same sports. Athletes dread knee injuries because they can signal a premature end to their season, particularly if a knee ligament is torn. The National High School Sports-Related Injury Surveillance Study has found that incomplete ligament tears (32 percent), contusions (15.2 percent), complete ligament tears (13.2 percent), and torn cartilage (eight percent) are the most common knee injuries. While 43 percent of athletes sustaining a knee injury are able to return to play that same week, 30 percent miss at least three weeks of play or are forced to discontinue the season. This rate is particularly high in girls’ basketball, where half of all injured players miss at least three weeks of play or are forced to discontinue the season. Following a knee injury, 25 percent of all girls and 12 percent of all boys require surgery. Overall, knee injuries commonly result from contact with another person (52 percent), no contact/overuse mechanisms (25 percent), and contact with playing surfaces (15 percent). Dawn Comstock, PhD, is a principle investigator at the Center for Injury Research and Policy at The Research Institute at Nationwide Children’s Hospital. She is also an assistant professor at The Ohio State University in the College of Medicine and the College of Public Health. Her research interests include the epidemiology of sports, recreation, and leisure activity-related injuries among children and adolescents as well as the life-long health benefits associated with an active childhood. She can be reached at Dawn.Comstock@NationwideChildrens.org. Are your athletes different than you were at their age? Of course they are, and that is why we must coach them differently than we were coached. In this post get 22 Tips for coaching today’s athletes. Players today are different than they were when I was growing up… and I’m not even that old. I know every generation says that… but it’s true. One of the biggest changes to our society as a whole has been technology… more specifically the Internet… and even more specifically… mobile smartphones and social media. What does that have to do with athletics? Sports have always been and will always be an interpersonal activity that requires human connection and communication. But because of things like social media and the ‘everyone gets a trophy’ mentality, the Jimmy’s and Joe’s of 2015 are not the same as they were in 1995. And even though we can’t stop the waves… we can all learn to surf. Find out how to truly connect with your players. Find out what makes them tick, what motivates them and what is the best way to coach them (in front of their peers and behind closed doors). Embrace social media and technology… it’s not going anywhere. It’s important to your players, so it needs to be important to you. Learn to speak their language (I am not referring to profanity). The top 2 ways players communicate today is through text message and social media (particularly Instagram and Twitter). Learn to use those platforms. Understand this: consistency breeds excellence – excellence breeds trust – trust breeds loyalty – loyalty builds a strong program. Be consistent with everything you do. Players won’t respect you if you don’t. Encourage this 3-step mistake policy with your players – Admit it. Fix it. Don’t repeat it! The first time it is a mistake. The second time it is a decision. Coach attitude and effort before X’s and O’s. Without proper attitude and effort the X’s and O’s don’t matter. Clearly articulate your core values, principles and each player’s role. These are non-negotiable. They make up your program’s culture. Players want to know the why behind everything. So tell them! Explain why you do what you do, why you believe what you believe, and why you expect ABC from them. The higher the perceived relevance, the higher the buy-in. And at the end of the day, a coach’s #1 job is to get buy-in from every member of the program. Social media has created an abundance of superficial ‘friends’ – make sure your players know you truly care about them (on and off the court). That you have their back. Don’t try to be ‘friends’ with your players. If you are too close to them personally you can’t hold them accountable. You should be a role model, a teacher and a mentor… but not a buddy. Players all learn differently. Make sure you can effectively teach each type of learner (audio, visual, intrapersonal). Players want to show their individuality (shoes, haircuts and especially with pre-game starting line-up announcement antics and routines). Don’t fight it. Have some leniency within your program rules. Respectfully, today’s idols and role models are a lot different. Create a climate and culture that values people over productivity. Your players must know you care about them as a human being first and a player second. If you want to know if you are a good coach…ask your worst player. You’re either coaching it or you are allowing it to happen. You either accept it or correct it. Replace ‘but’ with ‘now’ when instructing a player. For example, “I like your release, now try to get your elbow over your knee.” This minor change will make a huge impact. Focus on what your players can be… not what they are. Science shows that most people have a pretty firm definition of what is right and wrong by age 13. Hold them accountable. Ignorance is not an excuse. However, learn to choose your battles. Kids will be kids. If a players posts something stupid on social media… don’t condemn them for life. Use it to teach a life lesson. Hold them accountable, but use it to teach. Players actually want to be held accountable. It shows them that you care and are invested in their success. Players today want to play immediately. They don’t understand the concept of ‘right of passage.’ Freshman want to play varsity. Young players want to play serious minutes. Learn to channel this desire but keep them focused on the process and the long term. One of the biggest changes between the players of 1995 and 2015 is with the parents. Parents are much more involved and much more vocal (especially on social media). Parents can be a tremendous support system… or they can be a total thorn.